Did Spanish Astronomers Steal A Dwarf Planet? In 2007, the Fourth Assessment Report (AR4) of the Intergovernmental Panel on Climate Change (IPCC) concluded that global warming is unequivocal, and that serious impacts of global warming are already beginning to occur. The AR5 isn’t due until 2013, but in 2009, a non-IPCC report called the Copenhagen Diagnosis was released to provide an update on the AR4. The authors found more evidence that various impacts were occurring, many of them at an increasing rate. This is the third in a series of posts on the arguments contrarians make against global warming. In Part 1, I discussed whether the global temperature had increased (short answer: yes). In Part 2, I discussed whether it had recently stopped increasing (short answer: probably not). I know I promised a post about the hockey stick, but that is turning out to be more difficult to write about than I thought it would be; so in the meantime, here is a piece about one impact of global warming. Claim: Ice sheets, glaciers, and sea ice are not melting. Fact: All of the above are melting. The Gravity Recovery and Climate Experiment (GRACE) satellites, launched in 2002, are able to measure gravity so sensitively they can detect changes in the mass of ice sheets (huge layers of land ice). 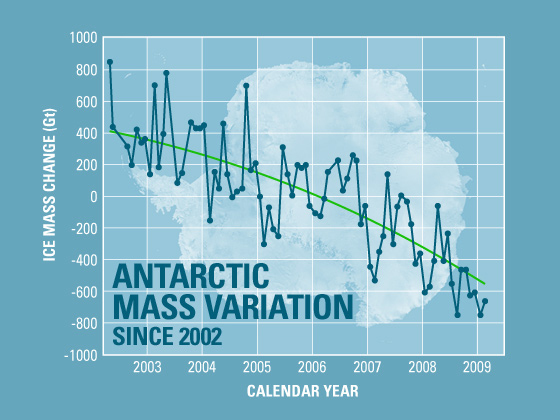 GRACE measurements show that since 2002, the Antarctic ice sheet has been losing mass at an accelerating rate. About a third of this ice loss has come from the East Antarctic ice sheet, which is much more massive than the West Antarctic one and was until recently considered stable. Antarctica is now contributing about 0.7 mm/yr to sea level rise; its ice sheet contains enough water to raise sea levels by about 53 m (see Copenhagen Diagnosis, “Ice Sheets of Greenland and Antarctica”). The Antarctic Peninsula has been warming particularly rapidly, and entire ice shelves have thinned or collapsed completely. Ice shelves are thick, floating platforms of ice formed when glaciers flow from the land onto the ocean surface. (Revised 18 March 2010:) They are being attacked both from within, as crevasses form at weak points in the shelves; from above, as meltwater from the surface seeps into crevasses and widens them; and from below, as warming oceans melt the ice on the bottom. (See Copenhagen Diagnosis, “Ice Shelves”.) All this makes the shelf thinner, weakening the “pinning points” where the shelf rests on solid ground, which in turn spreads the rifts and eventually results in a collapse. In 1978, John Mercer identified the collapse of ice shelves on the Antarctic Peninsula as a warning sign of dangerous warming in West Antarctica. In the past 20 years Antarctica has lost seven ice shelves,including the 3,250 km2 Larsen B Ice Shelf in 2002, which had remained stable throughout the previous 12,000 years. The 17,400 km2 Wilkins Ice Shelf shrank by 3,700 km2 from 1990 to 2008, and a further 3,400 km2 from 2008 to 2009. When ice shelves melt, they do not directly add to sea level rise. 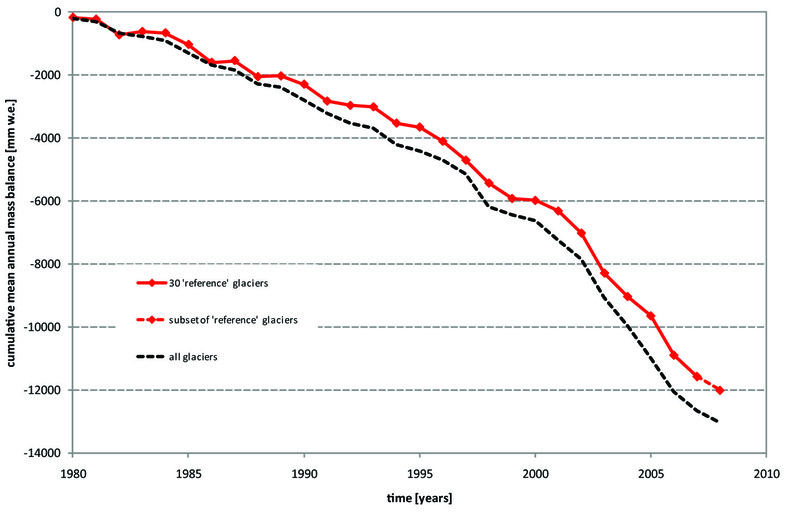 However, observations following ice shelf collapses have found that glaciers held behind them accelerated dramatically. This suggests that such collapses significantly speed up the melting process delivery of land ice to the ocean, helping erode the ice sheet’s stability. The weakening of ice shelves has also been observed along other parts of the West Antarctic coast (see Copenhagen Diagnosis, “Ice Shelves”). If part of the enormous Ross Ice Shelf, which holds back some of the main West Antarctic glaciers, were to warm a few degrees, then it too could begin to break up. However, when it comes to climate change, southern sea ice is not as important as the ice sheets or Arctic sea ice. Unlike the Arctic Ocean, the Southern Ocean is already almost ice-free in summer. And a decline in winter sea ice would not significantly change the Antarctic climate (because that is the time of year when it gets the least heat from the Sun). The five most recent minima have been the five lowest; all were well outside the projected range. 2009 came third lowest at 5.4 million km2 (compared with the 1979-2000 average of 7.0 million km2). The record-shattering 2007 minimum was just 4.3 million km2, opening for the first time the Northwest Passage shipping route from the Atlantic to the Pacific. And this phenomenon is not limited to Septembers. 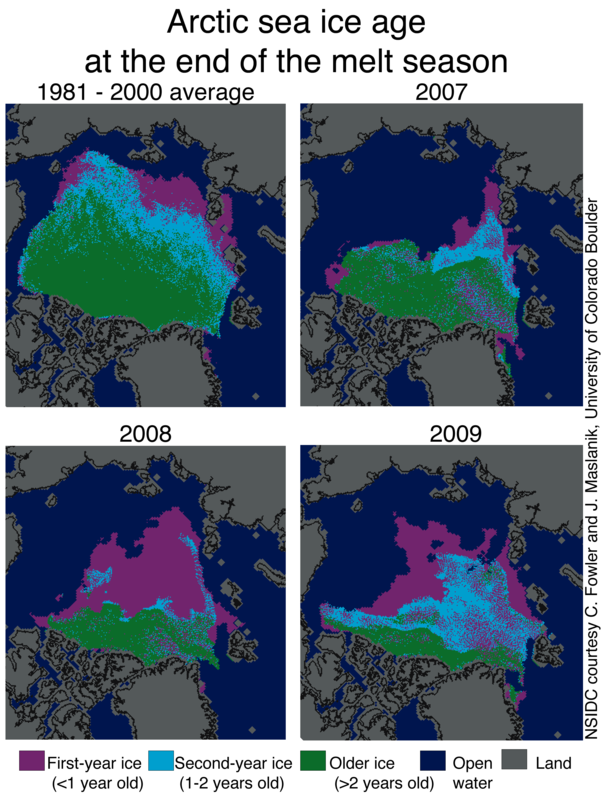 Arctic sea ice has declined at varying rates in every month of the year. Older and less reliable shipping records suggest that sea ice was also low in the 1930s and 1940s (when the Arctic was relatively warm); but then the melting was less widespread. At the end of the 2009 summer, a record-breaking 81% of ice cover was less than two years old, making it easier to melt in future summers. Many cooler summers would be needed for the ice to recover. Melting sea ice does not directly affect the sea level, but it does decrease the albedo (reflectivity) of the Arctic from 90% to 10%, accelerating the warming process. This explains why the Arctic is the fastest-warming place on Earth. According to the Copenhagen Diagnosis, ice-free Arctic summers in coming decades are very likely already inevitable. What does all this mean for sea level rise? The IPCC’s 2007 projection of 18-59 cm by 2100 was based on thermal expansion only and did not take into account the contribution of the ice sheets. More recent (but still highly uncertain) estimates are around 0.5 to 1.5 m by 2100. A 1 m sea level rise would displace about 160 million people. Coming up in future posts: a history of the “hockey stick” controversy; a discussion of CO2 and the greenhouse effect; a look at how humans have changed the carbon cycle; and more on sea level rise (though not necessarily in that order). Don’t go away! Update 15 April 2010: Greenland’s ice loss is spreading. Update 15 April 2010: Although the Arctic has remained relatively warm, Arctic sea ice did not reach its annual maximum until 31 March, the latest on record. The month of March had its fifth lowest sea ice extent, 15.1 million km2 (the record low of 2006 was 14.4 million km2 and the 1979-2000 average was 15.8 million km2). Thanks to the Arctic Oscillation, more old ice was retained during the winter, which may contribute to a higher minimum this summer. Update 5 May 2010: As mentioned above, the Arctic is warming much more rapidly than the rest of the planet. Now a new study has found further evidence that this is mainly due to a change in albedo caused by less sea ice. If the “amplification” of Arctic temperature were due to changes in circulation, we would expect to observe it high in the atmosphere. But Arctic warming seems to be occurring mainly near the surface, as we would be expect if it were due to an albedo feedback. Update 8 August 2010: A 260 km2 ice shelf has just broken off the Petermann Glacier in Greenland, the biggest such event in the Arctic in nearly half a century. Andreas Muenchow, a professor of ocean science at the University of Delaware, said that because records around the glacier had only been kept since 2003, “Nobody can claim this was caused by global warming. On the other hand nobody can claim that it wasn’t.” I expect the first half of that quote to be repeated on a lot of contrarian blogs. Update 18 August 2010: Climate modelers Judith Curry and Jiping Liu have discovered that paradoxically, the growth of Antarctic sea ice is caused by the warming of the Southern Ocean. A warmer ocean means more water being evaporated from the surface and falling as snow off the coast of Antarctica. However, the modellers tentatively predict that further warming in the Antarctic would cause the trend to reverse during the 21st century. occurred without significant surface melting. The key is thinning, leading to reduced strength and reduced contact with pinning points. This allows rifting to spread and then the ice shelf breaks up. this can be enhanced by basal melting, surface melting or a change in ice shelf flow rates. In terms of glacier mass balance, each of the last three decades has seen increasing negative mean balances and with 2009 it appears certain we will the 19th consecutive year of negative balances. Glacier by glacier this means retreat. I’ve added a few sentences above to try and clarify some of those points. I hope it makes more sense now.